The news is out! Duluth Screen Printing has entered the embroidery game! We’re now accepting orders for all embroidery jobs. Headwear, hoodies, jackets… The possibilities are endless. Pair this up with our screen-printing capabilities and your vision is as good as complete. We’ve brought on a stellar addition to the team to act as embroidery manager. Brad Bergslien is the owner and founder of Harmonic Goods. He’s a driven outdoorsmen with an eye for detail and quality standards. Check out his interview below and get your orders in for your next embroidery project today! DSP: What is your favorite part of the embroidery/decoration process? BB: Seeing all the machine heads working in sync for sure. Coming from a sewing background, I always liked a sewing machine’s ability to poke holes in a variety of materials while locking a stitch. And so, between the diversity of garments and the machines timely output, I'm just plain excited! DSP: Where are you from? DSP: How old are you? BB: Not the oldest here, but next in line! BB: It's quite unnerving to live with a natural-born killer stalking around the house, and dogs are like toddlers...but who am I kidding, I love them both! DSP: Do you put sauces on everything or nothing? BB: Hot sauce or no sauce! 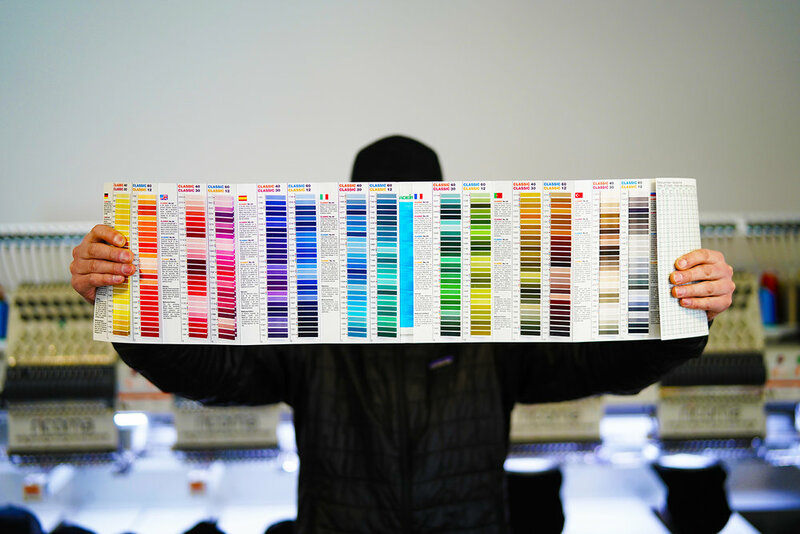 DSP: What excited you most about joining Duluth Screen Printing? BB: The youthful, hardworking crew seems to have so much potential and the vibe feels very conducive for growth! DSP: Favorite activity to do in Duluth during the summertime? BB: Camping up the shore with my family and fly-fishing whenever I can. BB: I barefooted once...and retired to dabbling in some combination of fly fishing, board-sports, biking, climbing, and the like. DSP: If you had to recommend a style of cap to a customer, what would it be? BB: Currently the Richardson 112FP - embroiders super clean! So you want to get some shirts printed for your business. Your old print shop hands over a MASSIVE catalog of t-shirts with little to no explanation of what to look for. We’ve done the heavy lifting for you and are all about working smarter, not harder here at Duluth Screen Printing. Here’s our picks for the Top 5 Tees to Screen-Print. You’re welcome. Meet the most affordable premium tee on the market. Tons of color options, soft with a tubular fit and complete with a TearAway label for easy-relabeling! 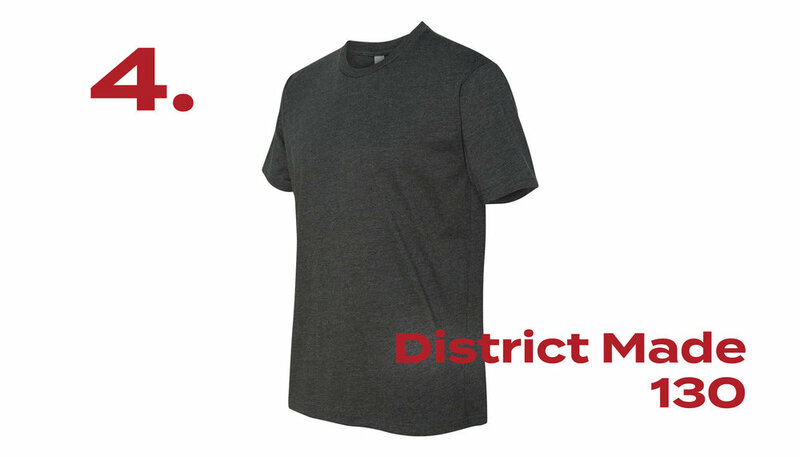 Tri-blend means more reasons for you to love this tee by District Made. 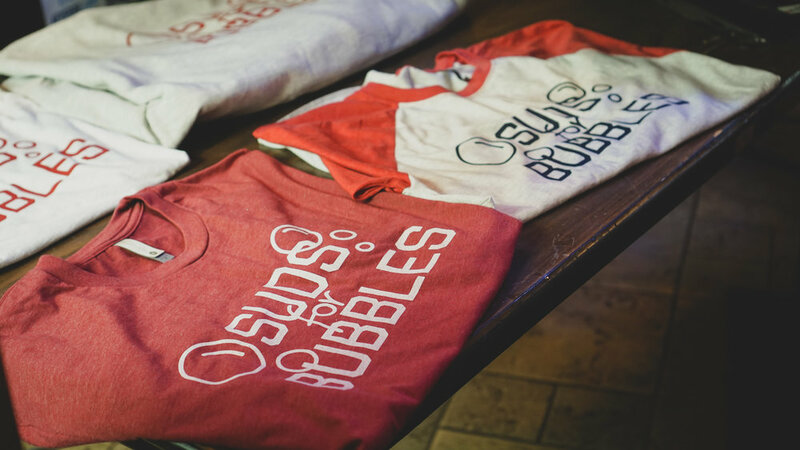 The most durable, super-soft tee on the market. Three yarns for a perfect, easy-going fit. Color options you can’t find anywhere else at a great, affordable price. Garment dyed means providing a naturally-worn look for a casual, unique t-shirt option. We aren’t playing around here. The CVC (standing for Chief Value Cotton) is one of our top-rated tees from our clients. The right price. The right fit. The right color assortment. A slam dunk. Our #1 pick for the best tee to screen-print? The Bella + Canvas Triblend tee wins it hands down. Why? It has the highest thread count so your prints come out looking stellar. Featuring a TearAway label, this is the tee that will have your customers turning heads wherever they go. Alright everyone, here is the deal with screen printing on a budget. You can spend as little as $100 on getting a basement print shop rolling. If that’s your budget, stop reading because this isn’t for you. -Don’t waste your money on a smaller or larger press. Get a 4 station 4 color. It will do all that you need and it will last you a long time. I’d recommend a Workhorse. 2) Get a used exposure unit. -Emulsion is expensive and so is time. Get a nice or used exposure unit to ensure your are hitting your times right. -Lots of people try and fail. When they fail, they sell. Buy that used ink because it lasts forever and you can save a lot of money on it. eBay always has some deals. When you need more supplies go to EBay and find some. You will always upgrade but passing up hot deals will bite you! Have you caught yourself looking at t-shirts in a store and when you went to feel it, it felt like sandpaper in your hands? That’s how much of us are feeling now-a-days with the tri-blend shirt becoming more and more popular over the traditional cotton shirt. The reason behind why tri-blend shirts are becoming increasingly popular? The feel of the shirt. Tri-blend shirts are made out of 50% polyester, 25% cotton, and 25% Rayon. That makes the shirt softer. Tri-Blend shirts also have more of a “distressed” look to them, whereas cotton shirts are traditionally more of a solid color. Once you have one shirt in your closet that’s tri-blend, you’ll want all your shirts that way. It’s addicting. Like when you finally get nice bed sheets for the first time with a nice thread count. There’s no going back after you’ve experienced that luxury. An Easy Process: From the first email that I sent to the final pick up of the shirts, I never once had to worry about anything getting lost in translation with the order. The form that I filled out and the experience coming from DSP made everything super smooth to completion. Customer Service: I had more orders than I had in stock and was worried I wouldn’t be able to fulfill them. Not 15 minutes after I sent an email to Duluth Screen Printing to ask about reordering, I had an email back saying it wouldn’t be an issue and I could pick up my restock tomorrow. Quality of T-Shirt: I was given multiple options when it came to quality. I was extremely happy to spend the little extra it took to get my shirts made on insanely comfortable shirts. To have the option to upgrade quality is a big deal for me, and it should be for everyone. Quick Completion: The whole process was easy as could be. In under a week from my first email to Duluth Screen Printing, I was holding the first custom t-shirt I ordered. There’s something special when you have an idea for a shirt and you see it in person. I really cannot recommend this company enough if you’re looking for custom screen printed t-shirts. They are going to take care of you more than bigger companies and make sure that you get the best possible product possible. This year for small businesses Saturday we headed over to our friends at Evolve Yoga in Duluth. We handed out just over 400 free t-shirts and chatted with some incredible folks. 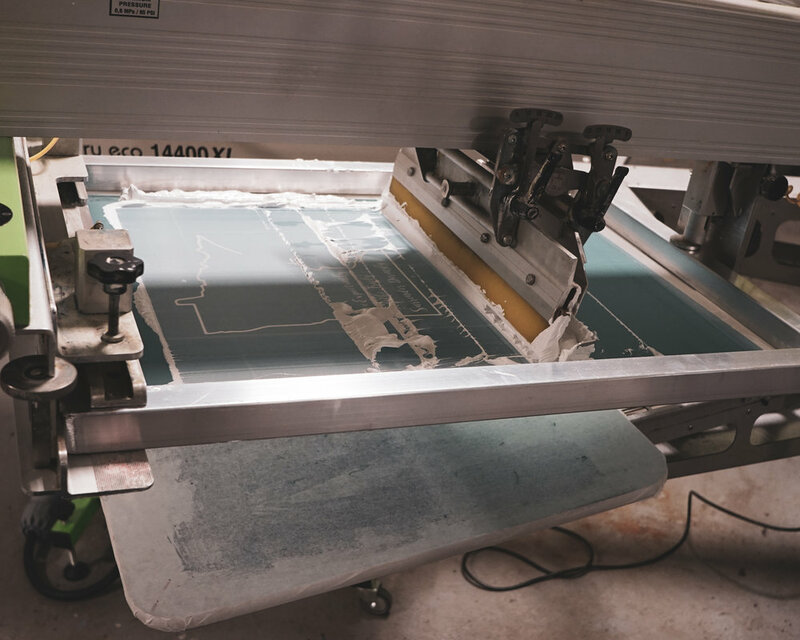 We explained our custom tee shirt printing process and how it all works. 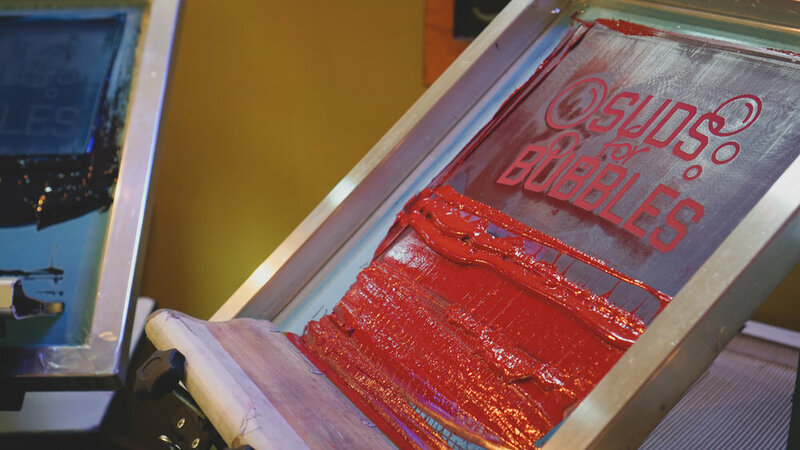 It was incredible to show everyone exactly what an custom screen printed tee was all about!